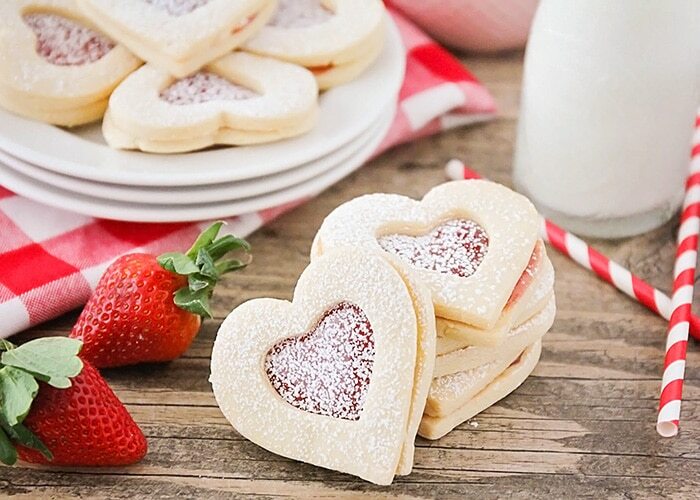 These beautiful and delicious strawberry linzer cookies are simple to make, and perfect for sharing with those you love! I’m teaming up with Crisco®, as a Crisco® Creator, to help inspire home cooks with new recipe ideas and cooking and baking tips.. 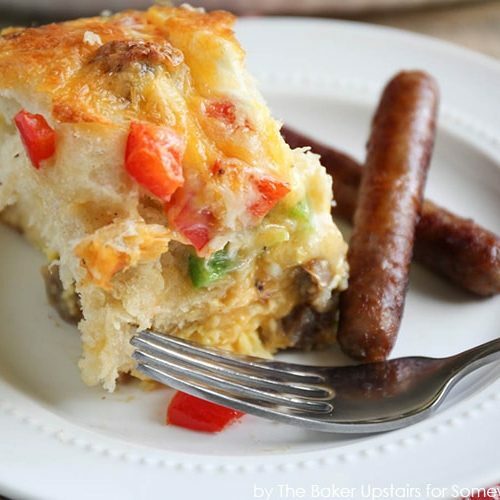 There are many ways to cook and bake with Crisco® shortening and it’s a lot easier than you might think! I know a lot of people get really into Christmas or Halloween, but Valentine’s Day will always be my favorite holiday. I love everything about it, from the pinks and reds everywhere, to the cheesy hearts and silly puns. It’s not even about romantic love to me (although I adore my husband). It’s a celebration of all the people I love! Since I’m pretty into food (as you may have noticed), I also love the chance to make festive treats to celebrate the holiday. 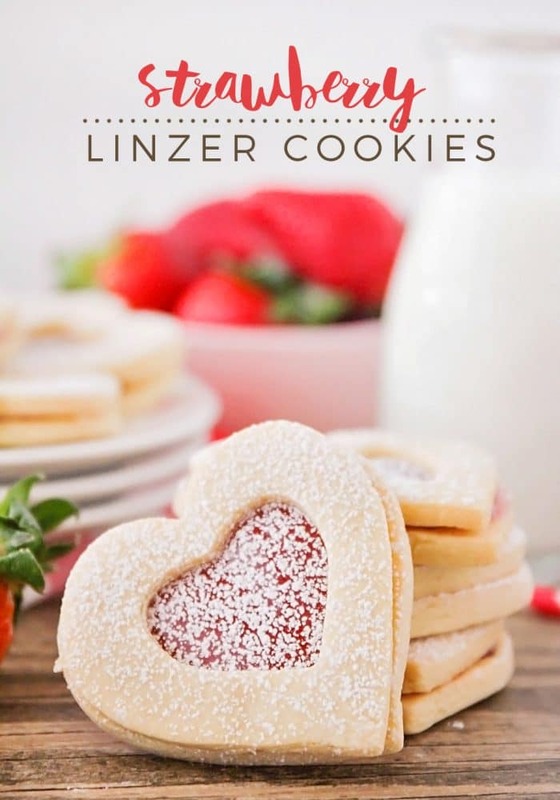 These strawberry linzer cookies are perfect for celebrating Valentine’s Day, but they’re so delicious, you’ll want to eat them year round! They’re simple and sweet shortbread sandwich cookies, with a little touch of strawberry jam in between, and a sprinkle of powdered sugar on top. I used Crisco® Butter Flavor All-Vegetable Shortening Baking Sticks to make these cookies, and I love how easy they are to use. Each stick is marked on the side with tablespoon and cup measurements, which makes it easy to get just the amount you need. They give baked goods a light and tender texture have no trans-fat per serving*. Technically, you could make these cookies any shape you desire. However, there’s something so fun about a heart-shaped cookie! I love the way they look when I’m cutting out the dough. You’ll bake the cookies in the oven, let them cool for a few minutes, then spread with strawberry jam and top with the other cookie halves. After that, they return to the oven for a few minutes to set the jam. As pretty as they are when they’re finished, a little sprinkle of powdered sugar makes them extra beautiful. These strawberry linzer cookies are tender and buttery, and deliciously sweet. I love the contrast of tastes and textures between the cookies and the strawberry jam! 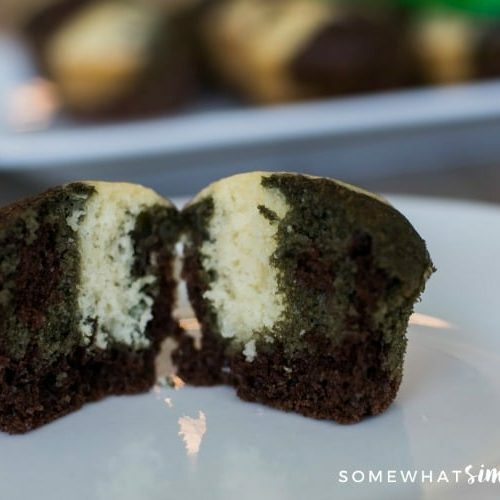 They would be perfect as a Valentine’s Day dessert, or a sweet treat at a tea party or birthday party. 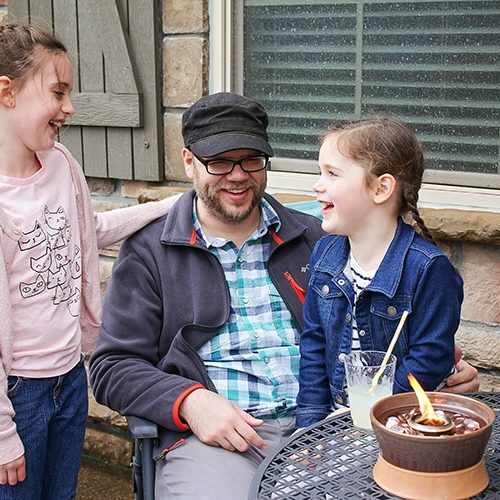 I hope you’ll make them and enjoy them as much as we do! If you need more baking inspiration visit Crisco.com or search #CriscoCreators on social media to find more great recipes! Preheat the oven to 350°F. Line two baking sheets with parchment or silicone liners, and set aside. 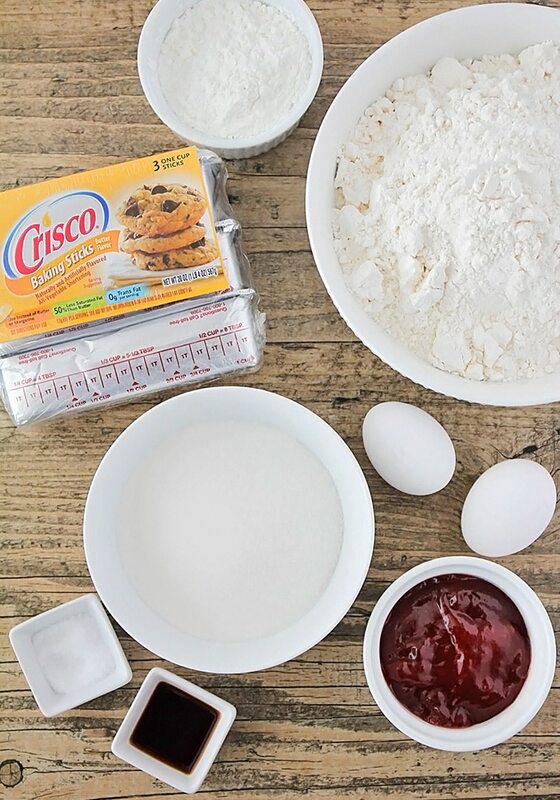 In a large bowl or the bowl of a stand mixer, beat together the Crisco® shortening and sugar, until light and fluffy. Add the eggs and vanilla, and mix until smooth. Add the corn starch, salt, and flour, and mix to form a thick dough. 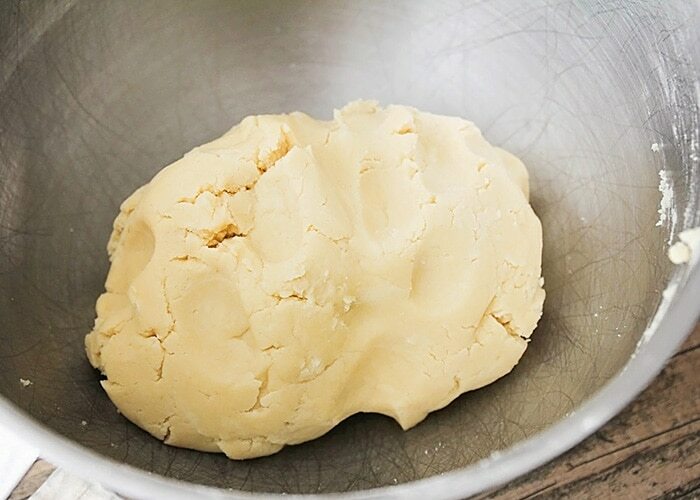 If your dough is sticky, add additional flour, a few tablespoons at a time. 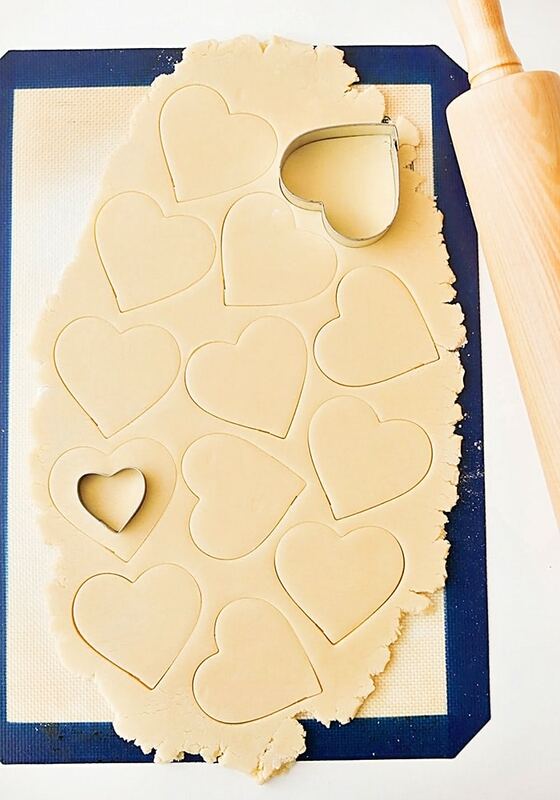 Roll the dough out on a lightly floured surface, and cut with a heart shaped cookie cutter. Using a smaller heart cutter, cut a smaller heart out of the center of half of the cookies. Place on prepared baking sheets and bake 10-12 minutes, or until lightly golden on the bottom. Remove from the oven (leaving the oven on) and let cool five minutes. 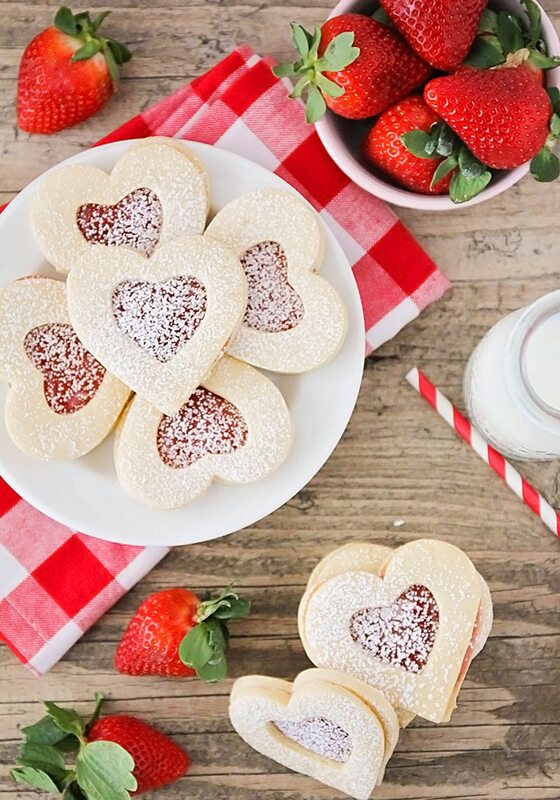 Spread 1 teaspoon of strawberry jam on each of the full heart cookies. 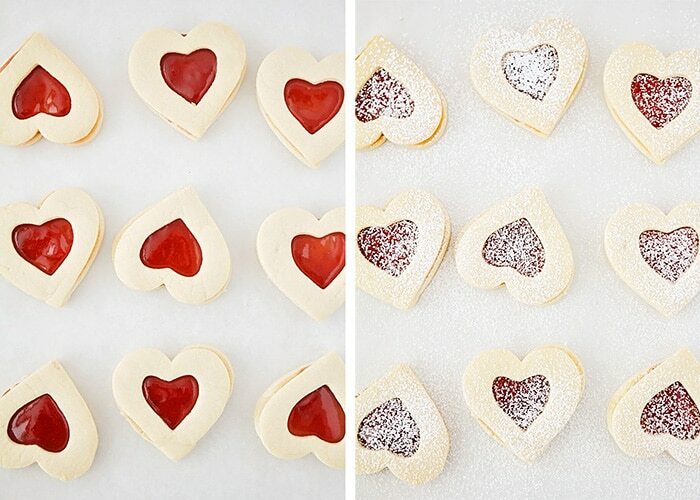 Top each cookie with a cut-out heart cookie. Return to oven and bake five minutes to set the jam. Let cool, then sprinkle with powdered sugar. As a participant of the Crisco® Ambassador Program, I’ve received compensation for my time and product samples for review purposes. Opinions are all my own. About how thick, would you say, you rolled the dough?